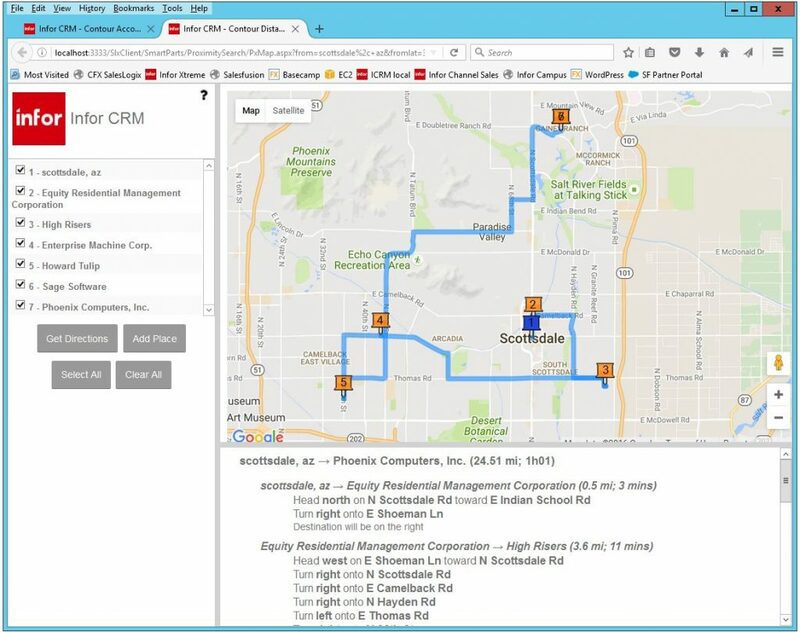 Infor CRM 8.3 update 04 Includes Interactive Mapping Features - Dynamic Enterprise Technologies, Inc.
Infor has released update 04 for CRM 8.3 which can be downloaded now from the Xtreme Portal. Infor is right on schedule with their commitment to release new updates to their CRM software every 60 days. Update 04 is significant because it not only contains many reported bug fixes but also adds an exciting new feature called Contour. Contour allows users to view one or more Accounts or Contacts on an interactive Bing or Google map using their developer API’s. It does this by Geo-coding your CRM address records which is handled automatically by a Job Manager job. It took me about 15 minutes to set up a Google developer project and generate the API key which is entered into CRM to complete the integration. Once I did that, the Job Manager polled Google and added the LON/LAT data for all of the address records in CRM. This took about 15 minutes for 2,000 addresses. Because the mapping job is running on a schedule, any new addresses added to CRM are automatically Geo-coded. All of the detailed instructions for setting this up are contained within the CRM’s Help system so there is no need to hunt down any documentation. The only changes in the CRM interface related to Contour are a new Common Task called “Show On Map” and under the Tools menu, Contour Distance Search. To use Contour, you select one or more records from the list view, click Show On Map and a new browser tab opens with all of the CRM records listed on the left and pins on the map displayed on the right. You can select a record from the list which highlights that pin on the map. You can also hover over a pin which displays a pop out showing you the specific address details for that record. You can also choose to have a driving route created for you by selecting “Get Directions”. Finally, you can add static places to your maps such as your home office address and the driving directions will use that as your starting point for the route. On the Infor CRM Mobile app, it can use your current GPS location as the starting point for giving you a list of nearby accounts. The Contour Distance Search feature enables you to see a list of CRM records in a list view based on their distance from one of your stored Places or from a City, State that you typed into the search box. What’s neat is you can then create a CRM group from these listed records and of course show them on a map.